This cartoon from the September 1, 1962, issue of the magazine Simplicissimus plays on the Greek myth of Europa and Zeus. In the myth, the beautiful Europa is kidnapped by the god Zeus (in the form of a bull) and taken to Crete. 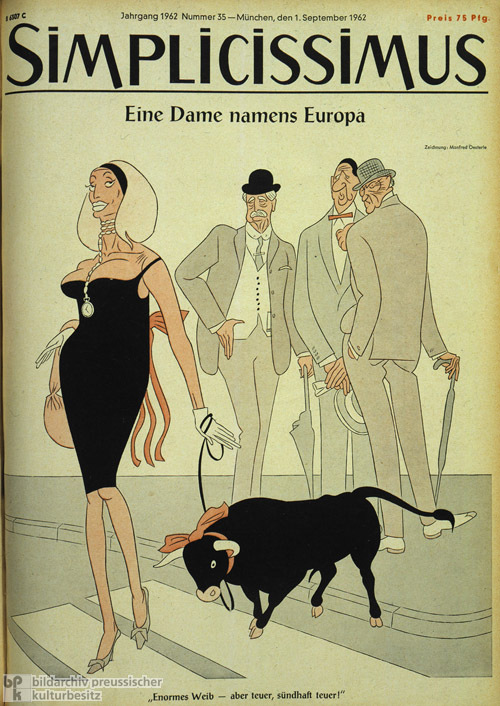 Here, “Europa” is depicted as a sophisticated, voluptuous woman leading a tame bull on a leash. British Prime Minister Harold Macmillan (left), French president Charles de Gaulle (middle), and German chancellor Konrad Adenauer (right) watch her as she saunters by. The caption (“Tremendous dame – but expensive, sinfully expensive!”) suggests that the process of European integration not only involved protracted negotiations but also high costs. Published right before de Gaulles’ state visit to the Federal Republic (September 4-9, 1962), the cartoon also alludes to the differing national interests that arose with respect to further steps toward European integration. De Gaulle aimed for an intergovernmental “Europe of Fatherlands” that excluded Great Britain; according to his conception, the six EEC member states (the Federal Republic of Germany, France, Italy, and the Benelux States) needed to increase their level of political cooperation to form a counterweight to the economic power of the U.S. and the USSR. Great Britain, for whom the economic advantages of EEC membership were paramount, had officially requested admission to the EEC on August 9, 1961. The Federal Republic aimed for a greater degree of supranational political integration and wanted Great Britain to be included in this process. Cartoon by Manfred Oesterle; photo by Dietmar Katz.